BIOWERT has have a very simple goal; they use raw materials as efficiently as possible in a closed-loop recycling process, so that we generate no waste water or waste products and only utilise minimum resources. 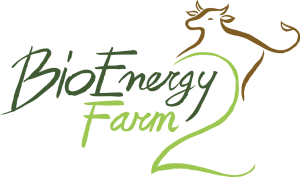 The bio-refinery concept is the beating heart of the BIOWERT process, where meadow grass (supplied by local farmers) and food leftovers (category 3 material) are processed into green electricity and innovative materials. 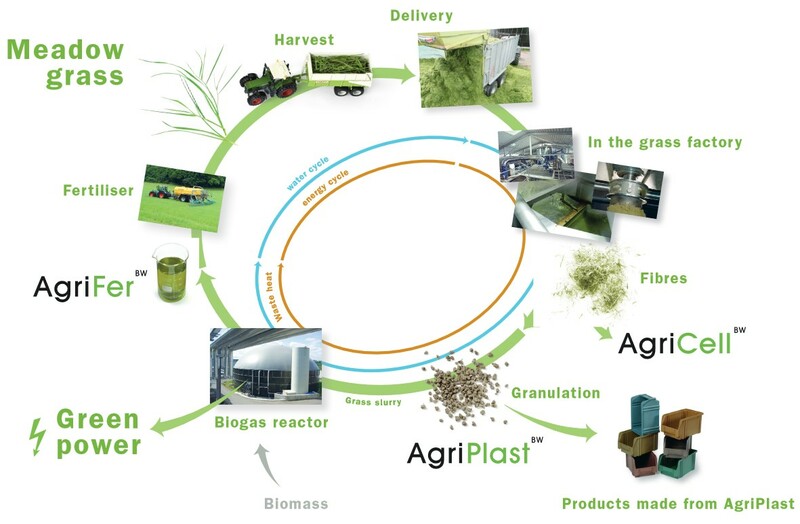 Using resource saving closed-loop recycling processes, BIOWERT manufacture plastics (AgriPlast which contain 25% recycled plastics and 75% cellulose from meadow grass) and terrace flooring material, insulation materials (AgriCell™) and fertilisers – all of which are urgently needed environmentally friendly alternatives to conventional products. The grass is firstly decomposed, the fiber fraction separated and then dried. The fibers can be used directly as an insulating material (blow-in) or be further processed into granules for plastic replacement. The “grass slurry”, the liquid fraction, is the main feed for the 1.4 MWel biogas plant, in which also the food leftovers are digested. The heat from the CHPs is used to dry the grass fibres during the day and at the night to run the hygienisation of the food leftovers, which sometimes delivered un sanitized. Since 2015, the grade of own-electricity utilisation is by 100%, which accounts for approx. 25 % of the total electricity produced. The required process water is extracted from the fermentation residue via a membrane system plant (ultrafiltration and subsequent reverse osmosis; capacity about 6 m³/h). This is previously separated by a decanter centrifuge. The press cake is delivered to the farmers, as is the concentrate from the membrane stage. Veuillez entrer ci-dessous votre email pour vous tenir informé. Please enter your email below so we can keep you updated.